The Pledge of Allegiance was Written By a Socialist - Fact or Myth? The Pledge of Allegiance was written by a socialist. The U.S. Pledge of Allegiance is an oath of allegiance written by Christian socialist minister Francis Bellamy in August 1892. It was meant to paired with a salute. 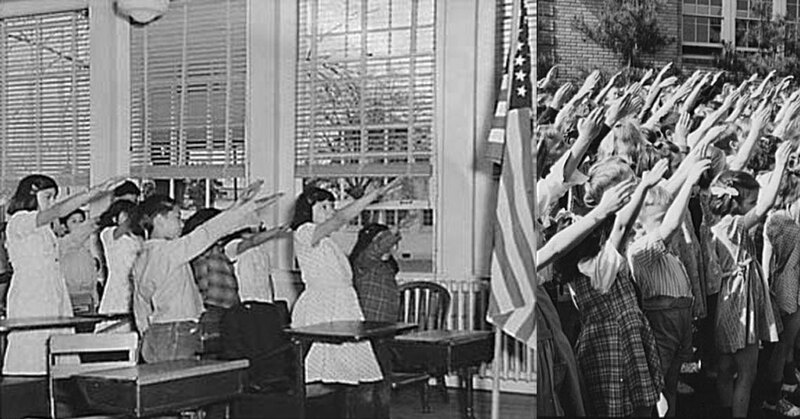 The salute, called the “Bellamy salute,” notably looks a lot like “the Roman salute”. These facts together make the whole history of the Pledge a little odd. NOTE: This story isn’t a statement on politics. It is just a quick recap of the odd history of the Pledge. Nothing less, nothing more. Liberty, equality, [fraternity,] and justice for all. Amen. FACT: The Pledge was meant for citizens of all countries when it was written. Originally the passage was going to denote liberty, equality, and fraternity (the Jacobin revolutionary saying of the French Revolution often embraced by socialists). FACT: The Pledge was used since its creation, adopted unofficially in the 20s, and formally adopted by Congress in 1942. Congress gave it the name the Pledge of Allegiance in 1945. One has to assume the concept was to make official a pledge allegiance to the U.S. to build nationalist sentiment during war time. Although we think of the pledge as American, Bellamy’s version was written for all people of all nations . Although the word God wan’t originally in Pledge, it was written by a Christian. Although the Pledge is a nationalist thing, it was written by a socialist. Part of the original idea of the Pledge was essentially to give the Roman salute to the flag (it was called the Bellamy Salute). That would be essentially the same salute the fascists used in WWII. Put it all together and it is an odd story that is likely not exactly what anyone would think. The Pledge of Allegiance was written by a socialist… and one was supposed to give a version of the Roman salute called the Bellamy salute to the flag. It is rather strange back story given the events of the 20th century. That is, the nationalist Pledge, was written by a socialist, and involved giving a Roman salute. That is all a little national socialist-y. LOL. This article was obviously written by a typical ignorant Anti-american leftist trying to portray the pledge and traditional American ideals as something bad. Sad. …also no doubt the person who wrote this article voted for the criminal Hillary and is still bitter over fact that we now have a true patriotic and God-fearing President in Donald J. Trump. Recanting the odd history of the pledge is not a statement against the pledge. If anything, if I identified as “a leftist – period” I would probably be proud that a socialist wrote the pledge. Liberty, equality, and fraternity amen. I don’t see how offering a quick recap of our odd history makes me ignorant. Also, nowhere here do I say anything negative about our American ideals. In fact, if you read the site, it doubles as a giant patriotic essay on the perks of liberalism and republicanism and Americanism. Sure, I’m not an America first guy, but I mean, I am a liberal republican, so how could you expect me to appreciate a know-nothing campaign of bigotry.? Now those recent Bush and McCain speeches though, that is something I can stand for. Just like, I’ll stick with the hand over my heart and avoid the old salute. There is absolutely nothing political in this article. You should just delete this idiot’s comments. They contain no sound or objective feedback, and only serve to proselytize his clearly delusional political beliefs. We generally post all comments that are on topic and not overly offensive. It might not always be a benefit to the article, but it keeps things honest. The one thing I most admire about The Pledge is the word “INDIVISIBLE.” Which of course means cannot be divided. But the nation IS divided in several ways. Perhaps there’s some esoteric symbolism to that word. It sounds very similar to INDIVIDUAL. Could there be a correlation with the kind of people who are not divided against themselves? Are these the kind of patriots who make up the best aggregate of our National soul? Words are as mysterious as numbers. They have secret meanings. “Indivisible, with liberty and justice for all.” Those are powerful words that set a very important tone. Further “the Republic for which it stands, one Nation indivisible, with liberty and justice for all.” That is perhaps even better. A little identity confusion here: George Thatcher Balch graduated from West Point and was therefore an officer of the U.S. Army and wrote the pledge mentioned here. George Beall Balch was “an Admiral of Mexican American War” and had nothing to do with the pledge. Thank you for pointing that out. That would have been hard to catch without someone mentioning it. Cheers! Not sure yet about your statement the that “The Pledge of Allegiance was Written By a Socialist” , however I do feel that everyone who wants to be an American should understand and want to pledge Allegiance to the Flag of the United States of America. I notice that most students today are being taught that our form of government is a democracy. The United States is a Republic using Democratic principles. I feel ashamed that we’ve gotten to the point that we no longer have prayer in our schools, we no longer have the pledge of Allegiance to our Flag and Country in many locations, that we have terrorists teaching our youth in many locations, that we have decided to promote socialism, I guess Russia was correct, when years ago they said the “United States would fall like an overripe fruit from within” . .I guess Pelosi, Schumer and the rest of the gang are really proud of themselves. I’m sure Russia is proud of them. When you have Bernie and Alexandria Ocasio-Corttez leading the parade, what else could you expect. The government that many of us grew up with, fought for, believed in and followed, I believe is gone forever. The pledge says one nation INDIVISIBLE. Since the last administration (Obama) this country has been more divided, than at any other time. Our children are no longer being taught the true values that made this country great. IT’s become a dog eat dog, who can score the best ratings so they cay keep their jobs, it doesn’t matter if the reports are true or false. It’s get President Trump out of office, so I don’t lose my perks and position. If American found out what I was really getting making on the side and how it was being done, I would lose all that. Sorry for all that, I just feel we had better values YEARS AGO THAN WHAT WE ARE SEEING TODAY. You might agree, you might not, lET ME KNOW BECAUSE I HAVE PAGES TO WRITE! I appreciate your insight and your opinion, but I don’t think you are giving enough credit to the right for their role in this and maybe are being slightly over dramatic about the role of the left. Obama may have divided a nation in some ways, but Trump magnified that divide taking it further than Obama ever did. Bernie and the gang might be for social democracy, pushing Medicare for all and such, but people on the right are pushing for things like citizens united to give corporations political power. I think we can easily point at both sides and questions if those are the best choices. Right-wing media and left-wing media will both sometimes present a narrative or opinions over fact, even when we know they have the facts because they report it on their other shows or articles. Sometimes politicians on both sides play politics. As for the pledge, it was written by a socialist. As for saying it, I do think it is a good way to up national pride. I think a lot of ideas we have aren’t fully right though. I don’t think schools are as corrupting as some on the right think, and I don’t think favoring the old ways does harm to new ways the way some on the left think. We could both go on I guess, and that is good, it is healthy to care. I don’t however think it is healthy to only understand one side of the debate. Truth is treason in a nation of lies. Fact is the “pledge” is definitely at least STATIST at its roots. Anything that puts children into the mindset supporting the most dangerous superstition of “authority” is not good. And for all you flag lovers out there…get a life.